This dish was truly worthy of gourmet treatment. I can see how each layer of the dish was designed to be a different taste and texture experience from the topping of Basil Coulis to the sweet grilled nectarine and rich corn salad all brought together by the succulent flavor of grilled scallops. 1) While waiting for the skillet to heat up and the water to boil for the corn, I whisked the dressing together in a large mixing bowl. 2) Cooked a bag of frozen corn for 3 minutes and mixed it with the dressing. 3) Pan seared the nectarines and chopped them up into small pieces (I saved one half to try as a layer.) and added it to the corn salad. 4) Chopped the tomatoes added it to the corn salad. 5) Made the basil coulis added it to the corn salad. 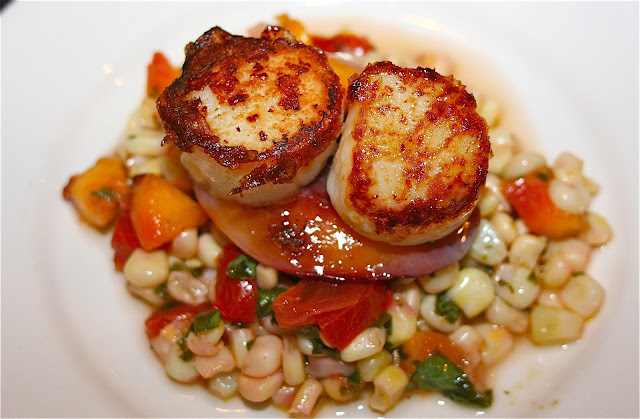 7) Upon my return I pan seared the scallops and served them on top of the corn salad. I loved the dish. Each bit offered a different flavor experience: sweetness from the nectarine, which really did acquire an almost wine like flavor when grilled, to the brightness of the basil and lime, and the crunch of the corn all topped with one of the simplest and most delicious seafoods: scallops. It is going to be interesting to see how everyone composed this salad. I didn't have a good mental image of how it was supposed to look. Thanks, yes I really wish Dorie included pictures of all the dishes. oh this sounds very good! I tried scallops once, but they just didn't turn out right. I don't know if I didn't cook them long enough, or too long. I think I'll try again though! 1) Dry the scallops well. Press paper towels on them. 2) Make sure the pan you are cooking them is lightly oiled and well seasoned or nonstick. 3) Make sure the oil is hot (Do the drop of water test it should sizzle). 4) Once you put the scallops in the pan don't move them for 3 to 4 minutes per side. This is how you get the nice brown crust. This looks and sounds so yummy, I can't wait to try it! I don't think I have ever cooked with scallops but have eaten them in restaurants before to this recipe will be a fun new one for me to try! Check out my reply to Adelina. I assure you they are actually easy to cook at home and all they need is a little salt for seasoning. Looks great! We enjoyed it too. Glad you enjoyed this! Love your description of the flavours. Nice job! I have been absent for a while but hope that somehow I'll be able to make this dish - it sounds so good! Loved your dog and kid issues - I can so relate! I've spent each day this week driving to and from soccer exactly when I would be preparing and eating dinner. And my dog always wants something when I'm in the kitchen!!! Great that your back... kids and pets can side track one. Your salad looks delicious. It was a favorite at our house too. I passed on this one because I don´t like scallops and nectarines are nowhere to be found. Wonderful pic! You made a great salad Diane. Have a great weekend! I used frozen corn too - just did not get to the market for fresh. I think I should have let my pan heat up a little more and then I would have gotten a nice crust like you did. Great job! Hot pan dry scallops key! Also if the scallops have been dipped in the chemical they use to keep them fresh they don't brown either. I aways check that the scallops are untreated. We loved this & so curious to see how everyone did with no photo inthe book to limit our creativity. I agree - definitely gourmet! we loved the layers of flavor from this one too!! :) great job!! This dish truly was greater than the sum of its parts. All parts seemed so expertly chosen. Great job! I love the way you adapted this to your schedule - you totally retained the character of the dish. The best part of this dish is how well all the parts come together. Thank you, I'm so glad to be part of this club or I may have made burgers that night. I'm glad I proving to myself that you can cook well even when you are busy. This looks great! After I made it, I realized that it was really all about the ingredients, so I think your version is really spot on. It all gets mixed up in the plate anyway! Thanks, but I could see that tasting the basil sauce on top of the scallop and then getting a bit of nectarine could separate and make the tastes more pronounced? Many things to report and ask. I bought the game Carcassone. Dying to learn how to play that game since I spent several days at Hôtel de la Cité last year. How is your dog? I had a case of scallop food poisoning several years ago and have not been able to get near one ever since. This week I made Salt but loved looking at everyone's lovely salads. Yours, included. I hope you enjoy Carcassone it is one of my son's favorites and he is a serious gamer. My dog is fine though she is a bit gaseous... not very pleasant when she cuddles up to me at night. I still feel so terrible about giving her that bad meat. I can understand having a temporary aversion to scallops after having food poisoning from it... probably the worst. but you must return. They only thing that would keep me from seafood would be an allergy. I love the way you made the recipe work for you! It looks terrific. I wasn't willing to do quite the full round of elements either, but I thought it was good. I like that something so elegant can still come together on a weeknight. I have to admit that I left the nectarines out since the other eater in my house refuses to eat fruit in savory dishes. I really enjoyed this one. That's why I chopped the nectarine up small. I tried to sneak it in. You should join this cooking group. I have put together some of the strangest things and they have been incredible a real culinary education.